I was very pleased to be invited once again to write a short article on ‘My Favourite Camera’ for the Members section of The Journal. There follows the original version, followed by the edited version that was print in the RPS members magazine. 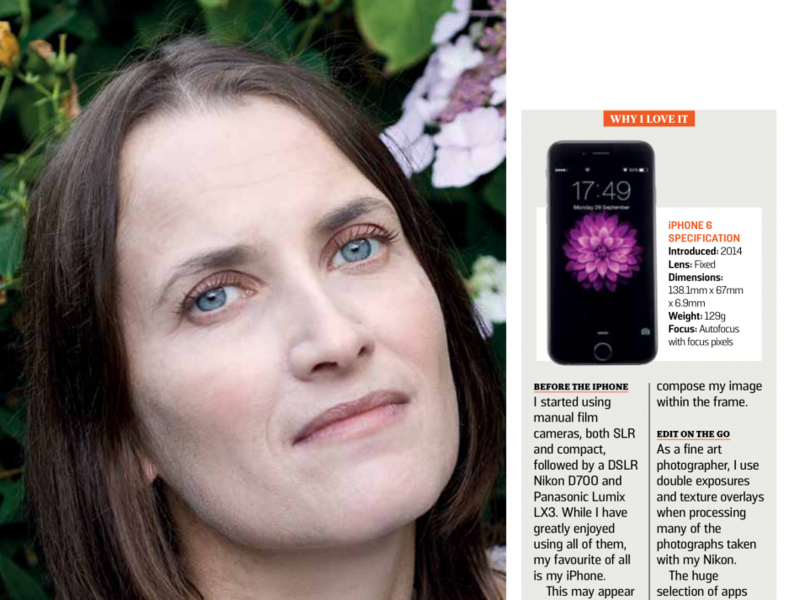 I was very surprised that the Editor printed the portrait of me so large – I was expecting it to be the usual thumbnail size, not bigger than the image I was writing about! This photo was taken by my friend Nicola Spencer a few years ago. 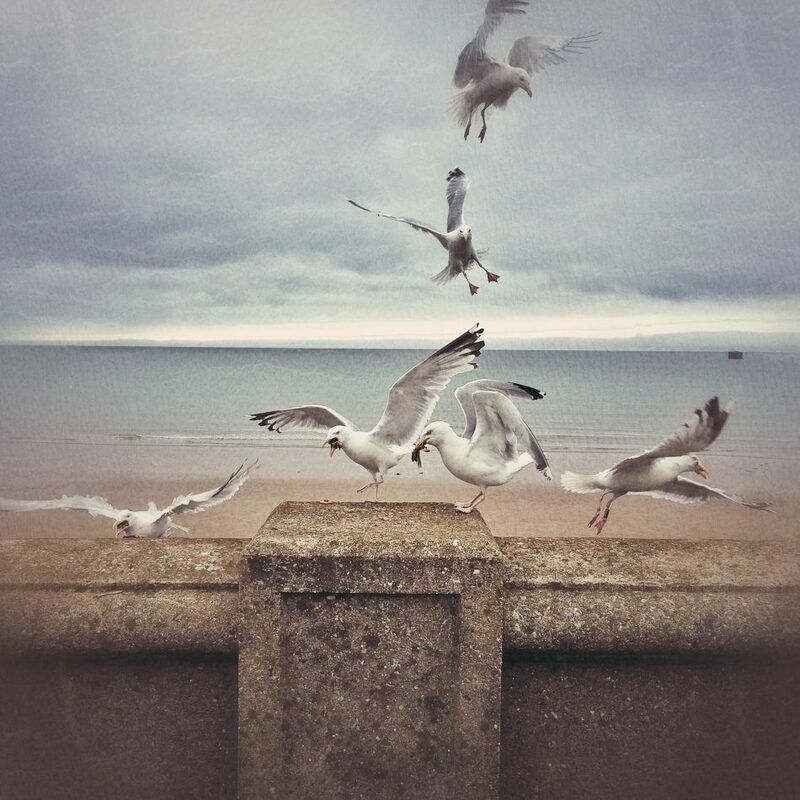 ‘I started my photography career using manual film cameras, both SLR and compact, followed by a DSLR Nikon D700 and Panasonic Lumix LX3, and whilst I have greatly enjoyed using all of these cameras I have to say that my favourite camera of all is my iPhone. This may appear somewhat Philistine when comparing it to my ‘real cameras’, but for ease of use, processing on the go and sheer fun it cannot be beaten. There is something incredibly refreshing about carrying this tiny, lightweight camera, as opposed to a big heavy bag bulging with the lenses, and I also enjoy the discipline of having a single fixed focal length lens to work with, which encourages me to think more creatively regarding positioning myself for the best composition. I absolutely love square format and was previously cropping in post-production many of my photos to this aspect ratio, whereas now I can ‘shoot square’ with the iPhone camera and compose my image within that frame. As a fine art photographer I use double exposures and texture overlays when processing many of the photographs taken with my Nikon. There are lots of creative camera and processing apps available for phone cameras, and in using some of these to process my photos I am working in much the same way as I would in Photoshop, so using my iPhone becomes an extension of the work that I was already doing. I am a keen user of social media and love the fact that I can process and upload photographs to Instagram whilst I am still out and about, for immediate sharing and comments. This entry was posted on Saturday, August 6th, 2016 at 18:05. 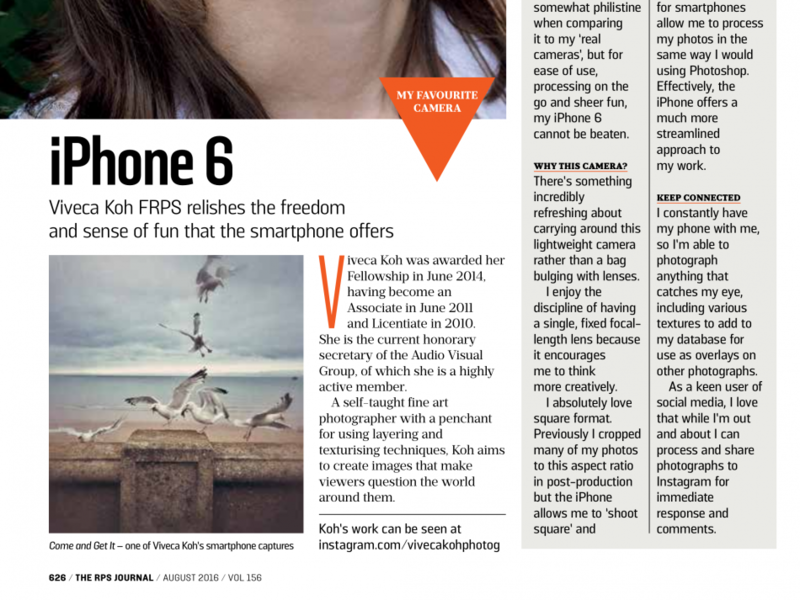 It is filed under Photography, Published Work and tagged with article, iPhone, iPhoneography, published, RPS, The Journal, The Royal Photographic Society. You can follow any responses to this entry through the RSS 2.0 feed.